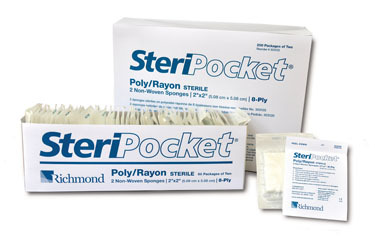 At Richmond Dental and Medical, our SteriPocket® Sponges have been one of our most popular products. Designed to make the lives of dental professionals easier—and to enhance the overall patient experience—these pre-sterilized packets of nonwoven sponges come cotton-filled, or made from a rayon/poly material. When you have a winning product that your customers love, any additional praise is just icing on the cake. We are excited to announce that our SteriPocket® Sponges have been chosen as a Preferred Product by The Dental Advisor for the third straight year. The Dental Advisor serves as an expert in dental products, providing “concise, accurate, and objective information” for dental professionals. According to their website, they “combine clinical experience with laboratory data and report on long-term in-vivo performance of materials over time.” After being reviewed by 29 consultants in over 1200 uses, our SteriPocket® Sponges received a 95% rating. We certainly appreciate this high praise, and we are honored to be recognized by an organization that is committed to offering objective reviews on dental products and equipment. The Dental Advisor delivers an invaluable service for dental professionals, ensuring that only the best of the best are used for patient treatments. To learn more about our SteriPocket® Sponges, check out this product review or contact us with questions.